“She” was the pseudonym of Gertrud Kinel, Georg Simmel’s wife, under which she published her own philosophical writings. The Simmels maintained a salon for intellectuals but otherwise enjoyed a conservative, bourgeois family life. They had one son. 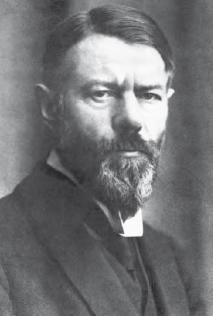 Max Weber interestingly combined ideas of economics with religion (Art Archive).